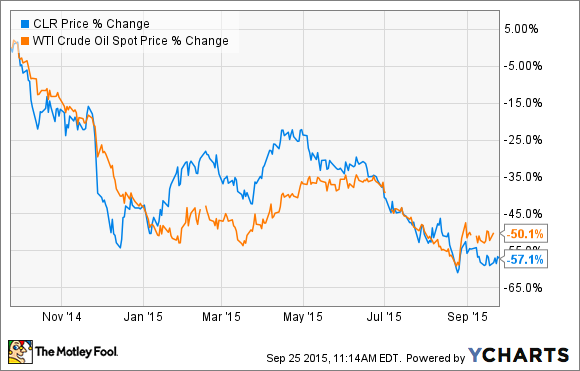 Continental Resources can’t afford for oil to stay below $50 for too much longer. The oil industry seems to be divided these days among companies that can easily survive if oil stays lower for longer and those that really need oil to rebound. Then there are companies like Continental Resources (NYSE:CLR), which is one of those right on the line. It's working its way toward surviving at a $50 oil price, but will struggle if crude stays below that number for a few more years. Like a lot of shale drillers, Continental Resources has been hit hard by the oil market downturn. As the chart below shows, its stock price has largely followed the slide in crude prices. That being said, some of its problems are of its own doing and not simply because oil is lower. Topping that list is the fact that it canceled its oil hedges early on in the crude price slide booking a small profit. It was a bold bet that crude oil would soon rebound, but it was one that the company should have never made even if it turned out to be right. That decision was one of many that forced it to take on $1 billion in new debt to fund its drilling budget. Not helping matters is the fact that its spending prior to the oil price collapse was a bit aggressive as it took on a lot of debt to acquire drilling acreage and drill new wells. 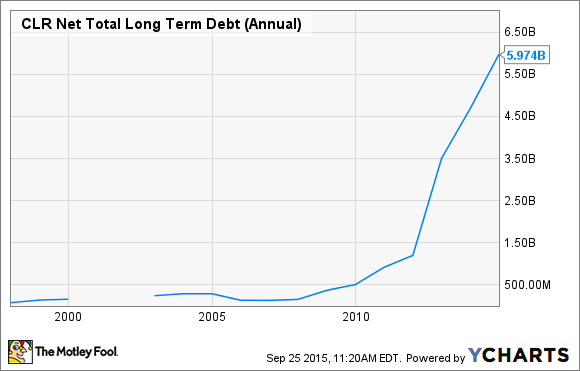 CLR Net Total Long-Term Debt (Annual) data by YCharts. That has left the company with a bit less breathing room than some of its peers, though it is nowhere near as deeply in debt as other shale drillers. Still, it's a large burden to carry, especially given that oil is half of what it once was. Today, we find Continental Resources working toward a much more conservative approach as it attempts to balance its capex spending with its cash flow. However, in order to do that, it needs oil to cost roughly $50 a barrel. That will provide the company with enough cash flow to drill a sufficient number of new wells to offset the production decline from legacy wells and therefore keep production flat. The problem lies with the fact that oil currently isn't at $50 a barrel, which means that Continental Resources will continue to outspend its cash flow. The company estimates that at its current run rate, it would outspend its cash flow by about $150 million at a $40 oil price. That's something that it can cover for a while since it has $1.3 billion in liquidity under its current credit facility, or roughly half of its available capacity, and unlike a lot of peers, that borrowing base isn't at risk of being redetermined this fall by its banks. Having said that, given its debt, being cash flow neutral is ideal and oil over $50 a barrel would be optimal. Continental Resources is getting much closer to being able to survive at lower oil prices. However, with current costs and production rate, it can be cash flow neutral with oil above $50 a barrel next year. That makes it a company to watch as another year of sub-$50 oil puts its long-term viability in question.